POWERFUL ANTI-AGING FORMULATION – Shown to reduce wrinkles, fine lines, discoloration & pigmentation giving the skin a smoother, firmer tone for an overall revitalized more youthful complexion. 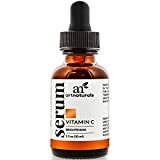 EFFECTIVE NATURAL ANTI-WRINKLE AGENT – our face and neck vitamin C serum is a powerful blend of antioxidants which protects the skin from environmental radicals including pollution and damaging UV rays. 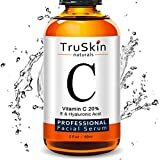 Vitamin C infused with Hyaluronic Acid and Vitamin E helps prevent acne breakouts, reduce acne scars and minimize pores. SMOOTHER SKIN – Tek Weh’s Vitamin C Serum stimulates collagen production making skin smoother, softer & brighter. It helps improve an uneven skin tone and brighten dull skin, improving skin elasticity. It can be applied all over the face and neck area or topically targeting problem spots around eyes, lips, forehead, and neck. SUPERIOR QUALITY – If you have sensitive skin, then no problem. Formulated using the highest quality natural ingredients with concentrated Vitamin C, this serum is not compromised with artificial colors, perfumes, harmful chemicals or paraben. Made in USA on the FDA registered facilities. 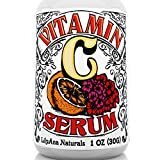 SATISFACTION GUARANTEE – Try Tek Weh Vitamin C Serum for face and neck with our 30-day any reason returns & money back guarantee.